Sometimes you just need a two-pound slice of chocolate cake. But in the unlikely event that you have a lighter appetite, if you find yourself in Whole Foods, you might want to consider their made-in-house truffles. On a recent visit to the Roosevelt location in Seattle (the one most likely to see Dave Matthews, I hear), I saw cookies and cream and German Chocolate varieties; I decided to give the Cookies and Cream one a try. 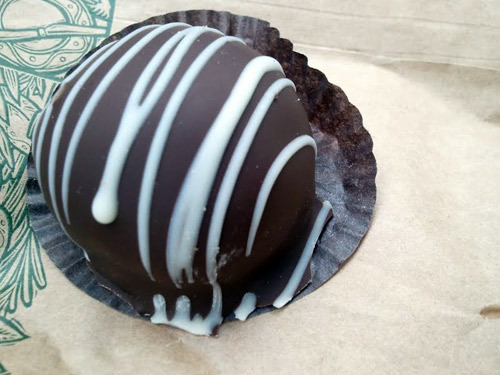 A little more substantial than a typical pre-packaged truffle but not quite as heavy as a full-size brownie, cupcake, or cake slice, I found the truffle extremely agreeable both in size, quantity, and in flavor: a smooth chocolate coating (fresh, not bloomed and stale!) containing a rich oreo creme-and-chocolate filling. A sweet little find; available by the pound, they will sell you them individually upon request; they average about $1 each depending on weight. Truffles by Whole Foods, made on-site in Seattle (and maybe near you too? ).